L-R: James Bailey, Chris Eldridge (Bruton Knowles) Kathryn Greenwood, Isabel Jones (Eden PR). 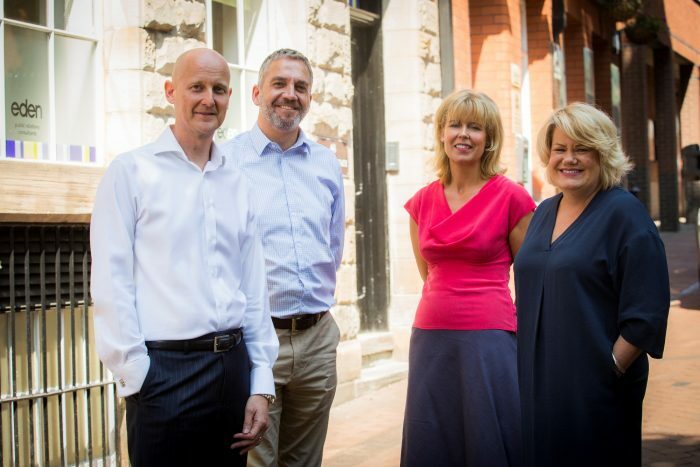 National property consultancy Bruton Knowles has appointed Nottingham-based Eden Public Relations to deliver a refreshed PR and digital strategy across its 12 UK offices, with a specific focus on the business’s expertise in its core sectors. Having previously worked with a selection of regional PR agencies supporting each of its offices individually, recently appointed Managing Partner at Bruton Knowles James Bailey decided a new strategic direction was needed to match an ambitious programme of expansion into target sectors. James, who has worked for Bruton Knowles for 20 years, felt Eden PR’s credentials and sector contacts fitted perfectly with his vision for the consultancy’s services. Covering the full spectrum of public and media relations, including marketing and digital, Eden’s suggestions have helped the senior team to shape a new approach to communicating both internally and externally. James said: “We’re delighted to announce that we’ve signed a contract to work with Eden PR exclusively, to deliver a refreshed, ambitious and integrated communications programme for all of our offices. “Eden’s approach brings our regional and national narratives in line with each other, with a specific focus on our new strategy and brand image, creating new perceptions of our business in our core sectors which include compensation and infrastructure. Joint Managing Director at Eden PR Isabel Jones said: “We’re thrilled to have been appointed by Bruton Knowles to manage its national PR and communications campaign – it is a significant account win for the consultancy. “We’ve already covered a lot of ground during the pitching process, outlining refreshed key messages, targeted media opportunities, a very detailed sector-led press relations programme and new approaches across social media. This has put us in a very strong position to amplify the Bruton Knowles brand and personality to a much wider and more tailored audience as per James’ brief.